What is horse conformation? Why is it important? How to judge it? In this article, we review basic conformation rules and provide good resources to help you understand how to evaluate a horse’s conformation. Read on to learn more. Your horse’s successful performance is closely tied in with his conformation. A horse who is not properly conformed (built right) for a particular discipline will not be able to succeed in that discipline. This will result in them being more difficult to train and less satisfactory. Suitability for a specific discipline is not the only reason to look for good conformation in a horse. 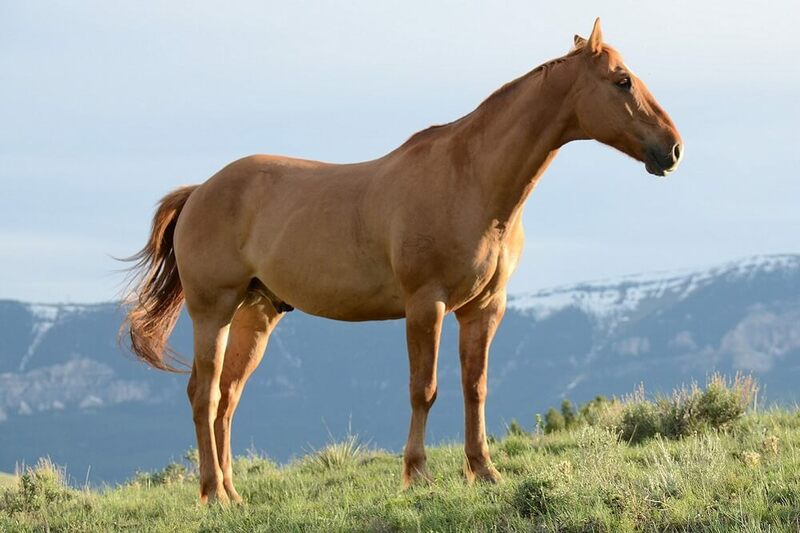 Generally speaking, horses who have poor conformation may be injured more easily and more often and may have a greater tendency towards lameness. When you look at a horse from the side as he is standing square (with feet evenly placed front to back and side to side), you should get an overall impression of symmetry. You should be able to mentally draw a square from the withers to the ground from front feet to back feet up to the hips and back to the withers. You should be able to judge that his neck is about 1 1/2 times as long as his head. The length of the head should be measured from the tip of the nose to the top of the poll (the bump at the top of the head between the ears). The length of the neck should be measured from the top of the poll to the middle of the shoulder. Overall, a horse’s neck should be equal in length to the horses front legs. It should also be approximately a third the length of the horses entire body. These proportions indicate a balanced neck and head. If the horse’s head is too big, he may be clumsy and move heavily on the front end. If the horse’s head is too small he may be unbalanced and lack action and suppleness in the front end. Aside from measurements, there are other qualities to look for when you evaluate a horse’s head. Be sure his eyes are wide set, bold and bright. His nostril should be large and clean. His ears should be set a little bit below the poll, not even with it. His lower jaw should be clearly defined, and the throat latch should not have a lot of muscling or fat around it. A horse’s head should join with the neck at an angle so that it’s easy for the horse to flex and move in a balanced manner. Your horse’s neck should connect with his body fairly high, leaving a good, deep chest area beneath it. The base of your horses neck should fall even with the point of his shoulder. This conformation provides for greater balance and flexibility. The angle of a horse’s shoulders should be between 40 and 55°. The horses withers should be directly above the elbow (uppermost joint in the front leg). When a horses body is properly portioned and balanced, leg structure is sure to follow suit. A horse who has straighter pastern and shoulder angles will have a short, choppy stride. This adds up to a rougher ride. A horse who is proportionate can be said to be square. Proportionate horses are symmetrical front to back and side to side. This includes symmetry in faults. Asymmetry results in stress points and can lead to problems and injury as a horse ages.